Now in his 36th season as Terrier mentor, Parker becomes the third Division 1 coach to reach that towering mark—joining Ron Mason and Jerry York—as well as the first to reach 800 wins at one school. 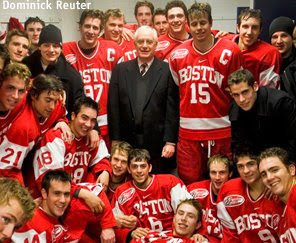 You can find complete coaching records for Jack Parker on the BU Hockey Archives site and a list of career milestones posted on our annex. The victory raised the team’s overall record to 19-5-1, making this year’s team only the second** ever at BU to enter February with 19 wins. The feat was first achieved during the 1983-84 season (pg.2) , BU’s final year in the ECAC and the first year when the Terrier season began in October. The 83-84 team, which was 19-5-0 as of Jan. 31, finished at 28-11-1, falling to Rensselaer in the ECAC title game, then losing to Bowling Green in the NCAAs. If you're wondering about those asterisks above, here’s the explanation. The 1993-94 team eventually had 19 pre-February wins on its record. The team’s record was 18-5-0 at the end of January, but several weeks later, an early-season 5-1 loss to Maine became a forfeit win due to the Black Bears’ use of an ineligible player (A 0-0 tie in February also became a forfeit win). So that 19th win wasn’t “earned” until well past February 1. That year's team, which reached the NCAA championship game, won 34 games, a BU record. Tonight's 3-1 win, with goals scored by Matt Gilroy, Brandon Yip and Colby Cohen, moved the Terriers within two points of first-place Northeastern in the Hockey East standings and also kept them in the top spot in the national pairwise rankings. Goalie Kieran Millan improved his record to 15-1-1.